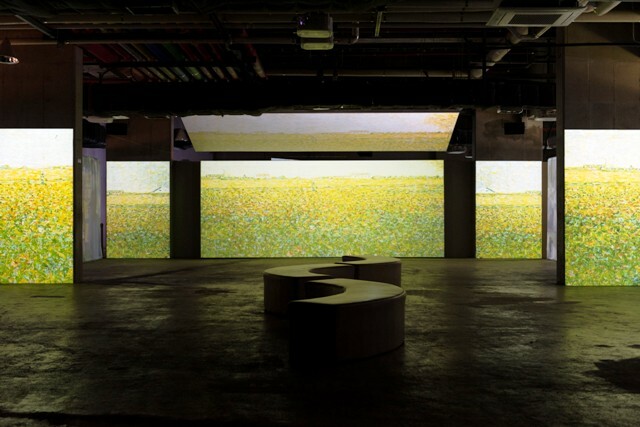 Van Gogh Inside: Festival of Light and Music has been held three times in Seoul but this is the first time this captivating multimedia project has come to Jeju. The exhibition uses different media to explore the life of the Dutch Impressionist painter, as well as a few of his artist friends and contemporaries. It launched at the Jeju Booyoung Hotel & Resort in Jungmun Tourist Complex on June 17 and continues for an unspecified period. Masterpieces from the artist's beginnings in Neunen, his hey-day in Paris to his emotional breakdown in Arles and on to his demise in Auvers are re-interpreted using digital media and other creative techniques. The exhibition journeys through the troubled mind of the painter through various zones using multi-media to tell his troubled story. His paintings and aspects of them are projected across side walls, floors and in front of the viewer to create an immersive experience. Meanwhile, music plays throughout the exhibition rooms, changing in style and tone to reflect the altered mindset of the painter and his descent into madness. 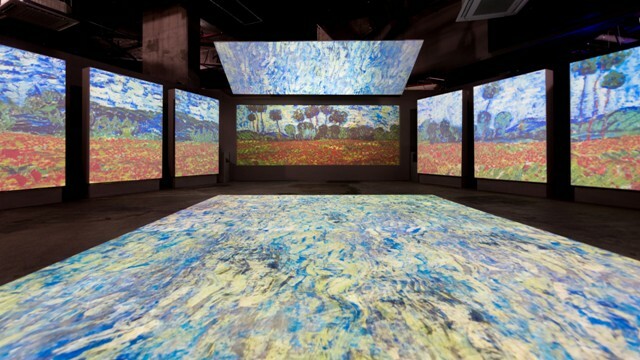 Aside from each zone, there are various rooms where the viewer gets to interact with Van Gogh’s art and style. In Gogh’s Atelier, baubles in colours from the palette of his most famous paintings, suspend from the ceiling. In a similar vein, Palette of Light invites visitors to design their own Impressionist works using sticks in colours often used by the painter. More interesting is Vincent’s Library where present-day photographs of locations featuring in some of Van Gogh most famous works hang from the wall. 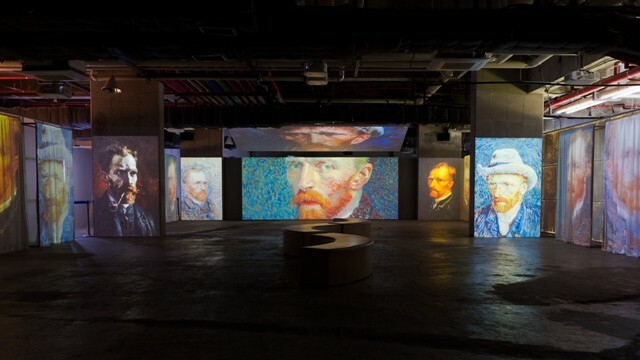 The viewer is invited to hold a computer tablet’s camera to each photo, swiping the screen to reveal Van Gogh’s interpretation. It’s a fun, interactive experience and one that provides insight into Van Gogh’s often slanted perception of the world about him. 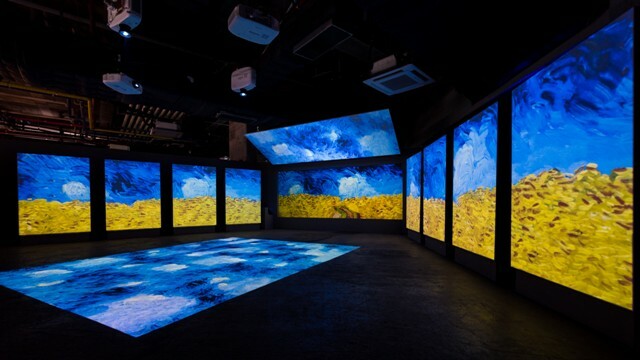 The immersive experience takes on a new level in the Night Cafe where participants can don virtual reality headgear and explore a Van Gogh painted scene. Inevitably, the exhibition ends with Wheat Field with Crows painted shortly before the painter committed suicide, the birds taking wing as the echo of the fatal gunshot fills the room. The overall experience is an absorbing one. And yet one might argue the best way to immerse yourself in Van Gogh’s artwork would be to freely examine his paintings at leisure. Immersive as this multi-media experience undoubtedly is, what remains most captivating is the artist, his work and the wider art movement of Impressionism. Where a trip to, say, Amsterdam’s Van Gogh Museum allows for scrutiny of his works, here his images are displayed fleetingly, swirling across surfaces, always in a state of flux. Were he alive to see it, one wonders what the Dutchman would have made of the exhibition, unsettled and unresting as it is? As an artist whose canvas was a window of his turbulent mind, it's quite possible he would appreciate these interpretations.